Over these last few weeks, we’ve settled back into our routine at home. The boys are out of school, so our house is quite loud and teetering on the verge of messy chaos. 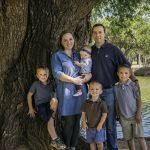 While Elizabeth’s diagnosis and medical issues still linger in our thoughts and plans and prayers, it has started to become a part of our normal. I have the insurance company on speed dial in my phone. I have a binder on my bookshelf full of MRI reports, lab results, and clinical notes. We spend hours each week in therapy at our home. It’s been an adjustment for all of us. Sometimes I feel guilty for the way these changes have affected my older boys. Mom doesn’t have as much free time as she used to. I fear that some days I’m tired and stressed and short-tempered and that I snap when I should support. 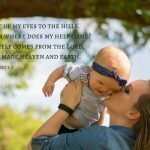 In those first days and weeks, my prayers felt fervent and urgent, like we were in a battle for her life. Five months later, the battle is still raging, but the warrior is feeling a little tired. Sometimes it feels a little bit like resignation -not the give-up, throw in the towel type, but the “let’s be realistic” . Yesterday, I was reading through Mark 2. In the city of Capernaum there lived a paralyzed man. He spent his days confined to a mat, dependent on friends and family for his needs to be met. His friend rushes to the courtyard where he was sitting. He had heard of Jesus’ healing abilities. The whole town was buzzing about it. It had just seemed so out of reach. Unless Jesus passed by where he was, he had no way of getting to him. It seemed unlikely that healing would ever come his way. He was afraid to get his hopes up, but if anyone could heal him, he was confident that this traveling Rabbi Jesus could. Even the demons were subject to his commands. His friend and family members arrived with a stretcher. They lifted him onto the pallet and hoisted the poles onto their shoulders. They began the trek from his courtyard across town to Peter’s home. When they arrived to the house, his heart sank. There were so many people. There was no way they could get inside. There wasn’t even room left to stand at the door. The men locked eyes with one another. Their gaze traveled to the roof above the room where Jesus was speaking. Their muscles strained as they carried him up the steps to the rooftop. Wiping their brows, they began to carve away at the clay underneath their feat. Soon they reached the mats of branches and could see the wooden beams beneath. Debris began to tumble into the room below. Peter looked up at the ceiling and then down at Jesus and then back up at the ceiling as a shaft of light broke through from above. Those gathered below began to ease away from the area as the man was slowly lowered from the roof above onto the floor below. The man on the mat looked around at those gathered in the room. He could see the scribes seated in a position of honor. They seemed annoyed at the intrusion. Peter seemed dumbfounded, which was a rare thing for Peter. Then he saw him. Jesus. His heart started beating faster. His eyes, he would never forget those eyes. It’s like they could see right through to your heart. A smile curved the corners of Jesus’ lips. He looked up at the four men perched on the roof top who were peering through the new skylight, waiting expectantly to see what Jesus was going to do. Meanwhile the scribes were inwardly stewing. Who does he think he is? Only God can forgive sins. He is a blasphemer, an enemy who must be silenced. Jesus turned in their direction. “Why do you question these things in your heart? Which is easier, to say to the paralytic, ‘Your sins are forgiven,’ or to say, ‘Rise, take up your bed and walk’? The room fell silent. Jesus allowed his gaze to linger on those who gathered in the room. Jesus knelt next to the pallet and looked straight into his eyes. Sensation began working its way from his toes to his calves to his thighs. He looked down at his legs and up at Jesus. He climbed to his feet, bent over and rolled up his bed, and began walking out the door. Each trembling footstep seemed like a dream. He straightened himself up and held his head high. Those standing at the door stepped to the side to let him through. His friends had already scrambled down the stairs from the roof. They threw their arms around him. Wiping their eyes they stepped back in amazement. The man placed a hand on the shoulder of his friend. Emotion threatened to choke out his voice. He looked at these four men. Their hands dirty from the clay. Their faces lined with beads of sweat. His heart was overwhelmed with gratitude, both for the healing and for those who carried him to the healer. There are some days that I feel like the paralyzed man who has shown up to the house only to realize the entrance is crowded and there seems to be no way to gain access to Jesus. While there’s not a doubt that Jesus can bring about the necessary healing, sometimes it feels like it remains just out of reach. 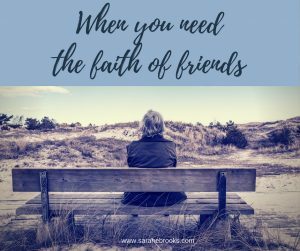 When I’m tired, and it feels like I can’t walk any further forward, that’s when I’m tremendously thankful for friends who carry us to Jesus. I’m thankful for friends and strangers who pray daily for the miraculous healing of my daughter. I’m thankful for church family who chip in to pay for plane tickets to see out-of-state medical specialists. I’m thankful for those who have shared stories of how God has worked in seemingly “impossible” situations in their own lives and in the lives of their children. Your testimonies are faith-building and an encouragement. Thank you for not giving up on us even though the journey is likely to be a long one. Thank you for digging through the mud and the clay and carrying us on your shoulders. I know Jesus is waiting on just the other side. If you feel like praying for the flat-out miraculous, here are a few things that only God can do. Increase White Matter in her brain (she has less white matter than normal). Restoration of the areas where she has deformities in her spine and ribs. Healing of any genetic causes for these issues. Side note: While it would absolutely thrill my soul to have one of those “God did the impossible” types of testimonies, he is no less good if he chooses not to intervene in some miraculous way. Through it all, we bring our requests to God trusting that the answer he gives is for a good reason. 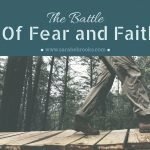 While we’re free to ask, we also have to be willing to accept the sovereign choices of God (Trust me…it’s easier said than done, but the knowledge that God is good, loving, and wise gives me the freedom to step back and say “I trust you,” even when we don’t get the answers to prayer that we long for). So yes, we’ll continue to pray for the miraculous until God tells me to stop, but even if the healing never comes, God has been and will continue to be abundantly good to us. 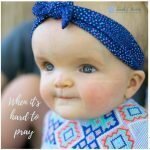 Pray that her hydrocephalus remains under control – that the cerebrospinal fluid continues to drain effectively and that her ventricular size remains stable or reduces. Pray that she’ll continue to make progress developmentally and physically as she works with her therapists. Pray that her scoliosis does not progress any further. Pray that she will not develop seizures or any neurodegenerative condition. Pray that her doctors will have the wisdom and supernatural insight they need to determine how best to address her medical needs. Pray for continued grace and peace. Pray for insight and wisdom in how to care for Elizabeth in the best way possible. Pray that our family bond will remain strong in the midst of ongoing stress and responsibilities. Pray that I’ll be able to take anxious thoughts captive (especially as we wait for a possible diagnosis from genetics). Pray that we’ll be able to see God’s hand at work in and through this situation. Pray that we’ll have opportunities to minister to others as a result of this season. For from him and to him, and through him are all things. To him be glory forever! Amen. 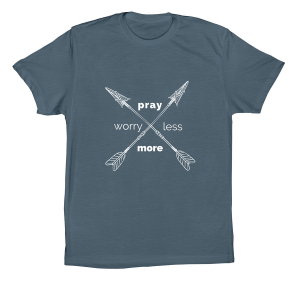 I created this shirt to remind me to pray more and worry less. There were a few people who missed the initial order period, so we re-opened orders. If you’d like to order a shirt, they are available until July 12th. The shirt is available in multiple sizes, colors, and styles. Sarah, I have written before about our son, Davy, who has Down syndrome. When he was small, we, too, prayed for complete healing so that he would be “normal.” But he continued on his own path in his own way of developing. What the Lord has done has made him a blessing. Even though he no longer talks, even though he will never write a book or start in a television show, he blesses people all along the way. Thank God for friends and their faith. We will continue to pray for God’s best for you and all the family. Thanks, Ann. I used to pray that Elizabeth wouldn’t have any struggles, but now I pray that she’ll have the strength she needs to get through them. Obviously, I don’t want her to endure physical pain, but I’m also coming to recognize that her “differences” may uniquely gift her go make an impact in a way that only she can. Sarah – your blog brings back such vivid memories even 11 years past. We still to this day pray for a miraculous healing for Claire’s CDKL5 condition. We still dream of her becoming a normal sister for her two sisters. However, the day did come not long into this journey when Mandy and Russell said they were OK with Claire just as she is. They couldn’t love her more if she were “healed”. They accepted that she is perfect for the Claire God created. 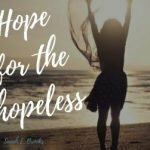 That changed a few things in their lives – it changed their goals for the therapists and eventually had to reach the time when Mandy had to say – that isn’t realistic, it isn’t going to make her better; we refused some of the ideas of therapists that caused pain and stress. Fortunately, her pediatrician and then all the specialists at Cooke’s have agreed – the goal is to keep her comfortable, work on the things that can make a difference – using new technology to find a way for Claire to communicate other than just non-verbally; do the therapies that will keep her joints (feet) from curling too badly, to help fix the kinks on her spine, etc. The rest is just to love her with all our hearts, talking with her, reading and singing to her, snuggling with her, finding ways to keep her more comfortable and safe. We’ve not given up on the miraculous – because many are the times in these 11 years when her “communication” has bounded on miraculous. Her sisters love her and it has taken heroic efforts on the part of Mandy and Russell to make sure they don’t feel their lives have been tied down because of Claire – they are thoughtful and understanding of the times when her interests have to be put first; but they also have their own special gifts and talents which have been cultivated by their family. NORMAL for them is quite different from my normal or even yours; but God is evident every single day in some way or another- even if you have to hunt and search for Him. I continue to pray for you, BJ, and your boys every single day and, of course, Elizabeth. 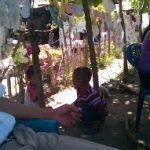 Her doctors and your extended family who struggle to know how to help. Promise me that if ever you just need to vent or want someone to pray over you, Elizabeth, or your family that you will call on me/us. If I could keep Elizabeth some time when you need special time with one or more of the boys – we’d love to help then, too.